I’ve owned a number of cars over the years, but my current one has been the one that I’ve owned the longest and for the most number of miles. 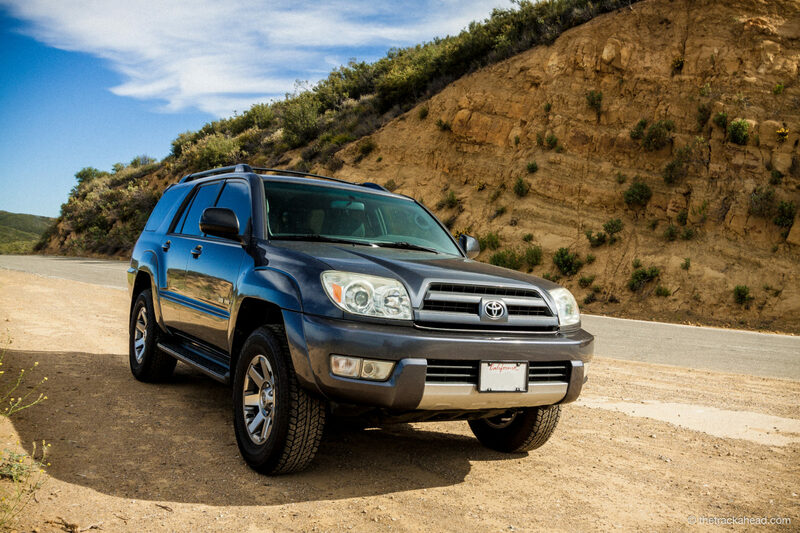 This car is my 4th Generation Toyota 4Runner. My 4Runner is an SR5 trim with the 1GRE-FE V6 engine, and is a 4×4. 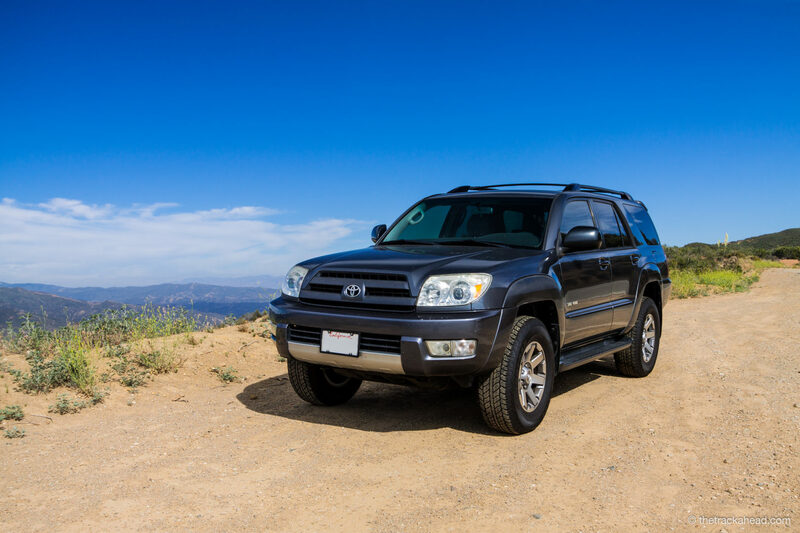 I purchased my 2003 Toyota 4Runner on 6/29/2013 for $10,000 with 139k miles on the clock. 5-1/2 years later, I’m happy to still be trekking on with the same car with 240k miles on the clock. One of the things my dad taught me to do when maintaining your vehicle is to write down everything you’ve done to your car with the associated date and mileage. 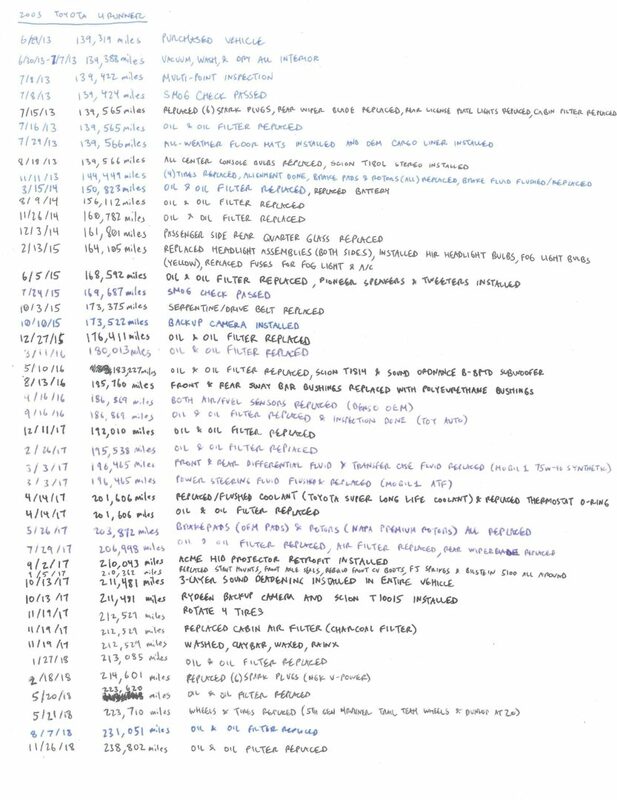 In today’s age of cloud computing and technology, I would normally track all of these things through a Google Sheet. However, I’ve always stuck to my roots of writing everything down instead. I’m not sure why I’ve never gone from paper and pen to an electronic form. Perhaps its complacency, or maybe I just enjoy the tradition of writing it all down. 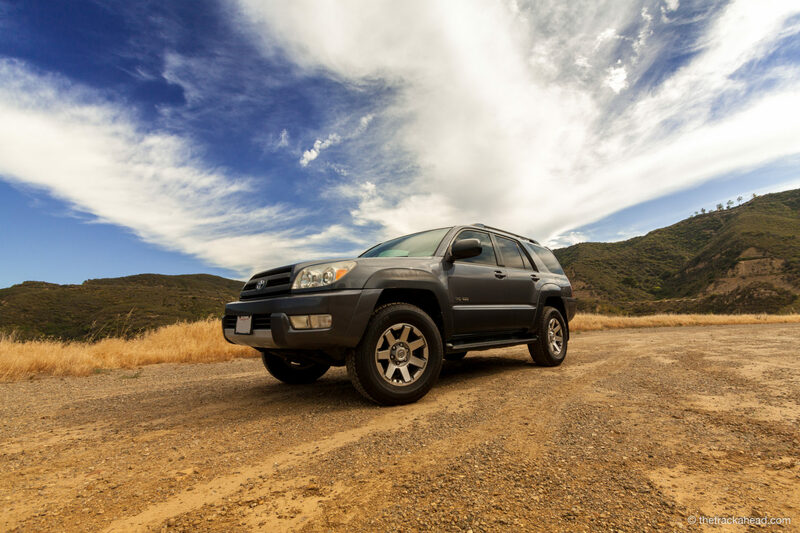 What’s Next for the 4Runner? Some of these pieces are priced quite high on Ebay and the like, so I’m waiting until I find a good deal. Perhaps I can hit up a junkyard and see if I can find what I’m looking for. I’ve already done all pads, rotors, and new brake fluid so I suspect that some calipers are frozen. I plan on replacing all of my calipers, maybe do the brake lines and resurface the rotors while I’m at it. Because I’ve already got my Rydeen backup camera set up to work with my head unit, I’d prefer to just use the same Scion T10015 head unit that I’m currently using. I’ll either take this head unit apart to see why the touch screen isn’t working, or I’ll wait for an Ebay coupon to come out to buy another used one for replacement. Currently running on the stock Dunlop AT20’s that came with my 5th generation 4Runner Trail Edition wheels. I can’t justify replacing them until I’ve worn down the tread on the tires. I’ve got a Yakima Skybox coming in which will be really useful when I take my rig out on the weekends with the family. A common 4th gen 4Runner issue… it doesn’t cause any trouble at this point so I’m going to wait and decide what I want to do with this. Replacement exahust manifolds are expensive! Another common issue on 4th generation 4Runners; there is apparently a spring that holds the shifter to the right position. However, this spring broke and now the shifter doesn’t stay in place if it has another lateral gear to move into. I’ll have to take this one apart and find a solution. Looking forward to using a Permatex fabric repair kit I bought! Keep an eye out for a review on this. With all the driving I do, I see drivers every single day who are distracted with their smartphones while driving, not paying attention, and even driving recklessly with no regards to those around them. I’d love to be able calm a crazy driver weaving in and out of lanes with a few chirps. Or even notify an unsuspecting motorist with their lights off at night. Scott enjoys fixing and improving cars, motorcycles, and his home in his spare time. He does his best to transcribe his journey as he navigates across unknown territory, finds himself in peculiar predicaments, and figures out how things work in the process. © 2019 The Track Ahead. All rights reserved.